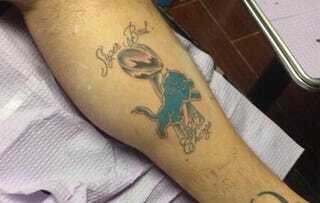 Your latest dispatch from the world of optimistic sports-fan tattoos comes from right here in the mitten state, where a Detroit Lions fan is hoping for good luck on Friday the 13th. No reason why; doesn't appear to be a contest or a giveaway or anything. It's on his inner calf on his left leg, so he could hide it if things don't work out.